Zoe Saldana arrived at the premiere of Avatar earlier this week in Hollywood. She wore a white dress with silver and gold panels along the front. It's a fun dress but I don't know if I love it. What do you think? Do you like Zoe's gold/silver/white dress? Olivia Palermo out and about in NY wearing a navy blazer, black blouse, shorts and black opaque tights. I love her camel Chloe bag! I'm obsessed with how adorable Miroslava Duma looks in jeans and this fantastic leopard jacket. 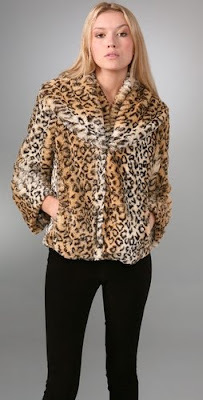 Hers is real - of course - but if you don't have $20,000 to spend on a new leopard fur (or are just morally against buying the real deal), I've found this cute faux fur leopard jacket by Alice + Olivia. It's on my 'want' list! Blake Lively attended the NY premiere of Sherlock Holmes tonight in NYC wearing a thigh-high black lace/cut out dress. Personally, I think she looks fantastic (and I'm super jealous of her fabulous legs) but what do you think - is it too much? Diane Kruger revealed the nominations for the 67th Annual Golden Globe Awards in LA today. I LOVE this dress! It's so playful and pretty and fun! Marion Cotillard looked stunning in white! She is perfection. Madonna brought her daughter out for the event. Both outfits are a little too 80's retro for me. Nicole Kidman wore a beautifully detailed black cocktail dress. Love it! I hate the shoes though - so boring! This dress is amazing! LOVE, LOVE, LOVE Naomi Watts. Okay - I have a big problem with this dress. It is hideous! Ugh, Penelope...why do you insist on dressing like a Miss World contestant? Fergie wore a grecian-inspired white column dress and looked lovely. I don't love the dress but I think that compared to Kate and Penelope, Fergie looks great! I couldn't resist another photo of MK and Ashley. Love these two! Olivia out-and-about in a stunning ruffled cardigan in NYC. 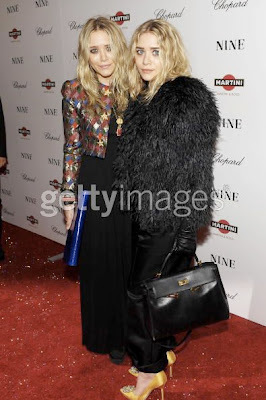 Stella McCartney attended the Established & Sons Christmas Party in London last week wearing an unbelievable jacket. Serious perfection! I'd guess it's from her line and probably costs a zillion dollars but I would buy it in a heartbeat. LOVE, LOVE, LOVE! Now this is a dress! Zoe Saldana attended the premiere of 'Avatar' in London in a show stopping dress. She may still be an up-and-coming actress but this dress makes her look like a star. Rachel Weisz attended the premiere of The Lovely Bones yesterday in Hollywood wearing an A-M-A-Z-I-N-G dress. I'm in love with it. And when did Rachel Weisz become so stunning? Olivia Palermo and her boyfriend Johannes Huebl attended the premiere of The Imaginarium of Doctor Parnassus at the Crosby Street Hotel in NY. I'm excited to see this film. Heath, Johnny, Jude and Colin all together on-screen in one movie is pretty much perfection! American Express is hosting the Toronto premiere on Friday at the Carlu and director Terry Gilliam will be in attendance. Can't wait! Two of my favourites - Anna Wintour and Tom Ford attended the after party for A Single Man in NY the other night. Tom directed A Single Man and the film has incredible buzz surrounding it. If only Karl was there as well - can you imaging anything more perfect? Although I can't really imagine Karl and Tom being willing to share the spotlight. Drew Barrymore attended the Tribeca Film Institute benefit screening of 'Everybody's Fine' in New York yesterday. I love this dress! So fun. NINE UK PREMIERE - OR WAS IT THE PROM? Kate Hudson attended in a hideous asymmetrical dress (straight from 1983). Penelope's dress isn't as hideous as Kate's but it's way too beauty pageant for me (and not very flattering). Nicole's outfit is much more casual than the prom dresses worn above but the detailing on the jacket and skirt are exquisite. And the shoes are great. I love this outfit but think it's a little too casual for a premiere like this. Saying that, I like her outfit much better than the dresses above. Fergie attended the Grammy Nominations Concert in Los Angeles last week wearing a very sparkly and spikey dress. I kinda love it. I think the spikey shoulders are super fun and playful. What do you think - is it too out there or are you feeling it? Barbara Martelo looked fantastic at Christian Dior during the last Paris Fashion Week. Her jacket is AMAZING! Saoirse Ronana attended 'The Lovely Bones' premiere in London last week in a fantastic dress. She's young and just beginning to experiment with fashion but she reminds me of Emma Watson a few years ago when she first started to make a statement with her red carpet choices. It'll be interesting to see if Saoirse follows in Emma's footsteps over the next few years (let's hope she stays clear of all things Lohan and Ebola-related). I think J. Crew has one of the best selections of costume jewellery around. They have fun and flashy earrings, statement necklaces and lots of other stand out pieces. 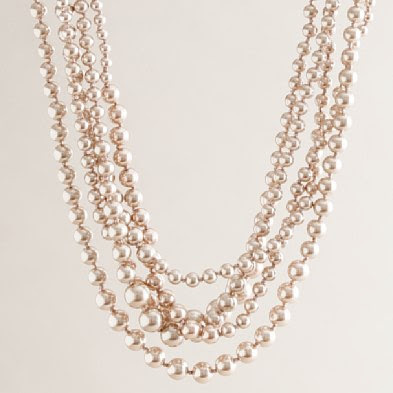 My latest obsession is the Pearl Twisted Hammock Necklace. It comes in two colours - pearl and light amethyst and is a great accessory for the holiday season! Claudia Schiffer attended an event to switch on Swarovski's five metre Crystal Snowflake at the Mandarin Oriental Hyde Park in London. I love this LBD! I've been searching for a flattering pair of boyfriend jeans for a really long time. Samantha and I have actually had numerous conversations on the issue. She's been very anti-boyfriend and tried to convince me not to buy a pair in the past. Well, that was before she discovered the Paige Denim Jimmy Jimmy Boyfriend jeans. She's now a convert and I'm obsessed with the amazing fit of these structured, flattering boyfriend jeans. They look comfortable but are super stylish at the same time. I just ordered a pair in this dark gray colour. Gwyneth Paltrow was at the opening of the Mamounia hotel in Morocco on Thanksgiving in an amazing pale pink draped one shoulder dress. Stunning! I've talked about my obsession with YSL lipsticks and glosses in the past but I just tried the new Gloss Volupte and it's a new favourite. The sheer gloss stick is uber moisturizing, contains Pomegranate extract and has a fresh Mango scent. It comes in four colours - Iced Lychee, Chilled Raspberry, Frozen Cherry and Frosted Plum (all are very wearable and pretty universal colours). 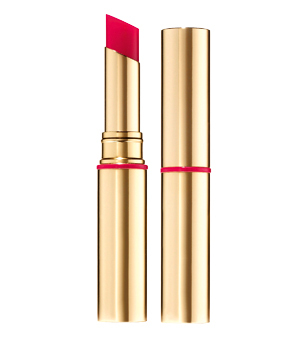 You can wear the sheer colour alone (it's almost like a tinted lip balm but with a great non-sticky gloss) or you can layer it on top of lipstick for a glossy shine. Natalie Portman attended a screening of 'Brothers' yesterday in New York wearing a stunning dress. I love the detailing and the way she mixed colours - ABSOLUTE PERFECTION! I can't wait to see this movie. 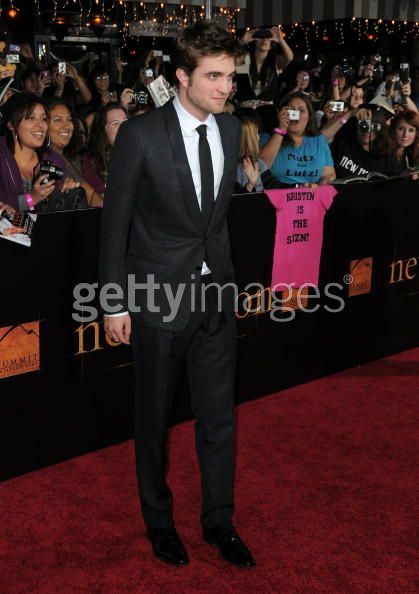 LOVE: Robert Pattinson looked great in Gucci. If his tie was any skinnier he would have been on my hate list (see Taylor Lautner below) but this worked. HATE: Ashley Greene decided to dress like she was going to the Golden Globes instead of the New Moon premiere. LOVE: Nikki Reid was the best dressed of the night. She wore a kick a*s Burberry dress with Christian Louboutin shoes. LOVE! LOVE: Dakota Fanning wore a Valentino dress (which I love) and red D&G shoes. She looks a little like she's playing dress up but it's still pretty great. LOVE: Charlie Bewley - this guy is seriously cool. Not many people can pull off a Jean Paul Gaultier suit like this. LOVE: Anna Kendrick wore a really fun multi-coloured one-shoulder mini with Miu Miu heels. HATE: Kristen Stewart wore an Oscar de la Renta prom dress. Excuse me, I just vomited a little in my mouth. Ugh - after seriously rocking some fun looks on the New Moon world tour (remember that fantastic dress from Madrid?) she showed up in LA looking like she was attending the Forks prom and she wanted to be a serious contender for prom queen. HATE: Taylor Lautner wore Calvin Klein. His suit gets a hate from me because of the horrible skinny tie. The pants look a bit funny too. Blake Lively attended a screening of the Private Lives of Pippa Lee in NY wearing a jacket that kicks some serious a*s. Obviously a bit risque but spectacular! I will dream about this jacket tonight and every night for the rest of the week. It's Marchesa and probably ridiculously expensive but worth every penny - start saving!